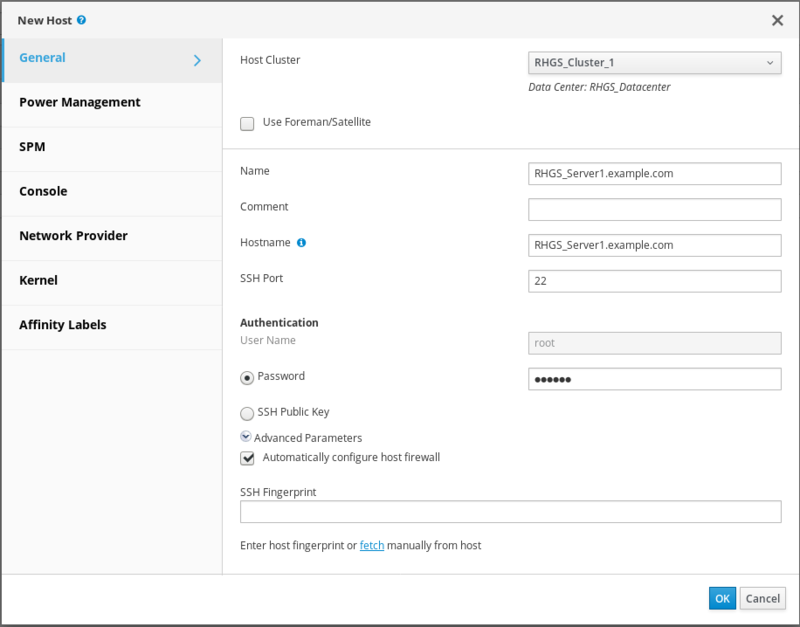 Red Hat Gluster Storage can be configured as a storage domain for Red Hat Virtualization, allowing you to store virtual machine images on Red Hat Gluster Storage instead of in network-attached storage appliances or a storage area network array. 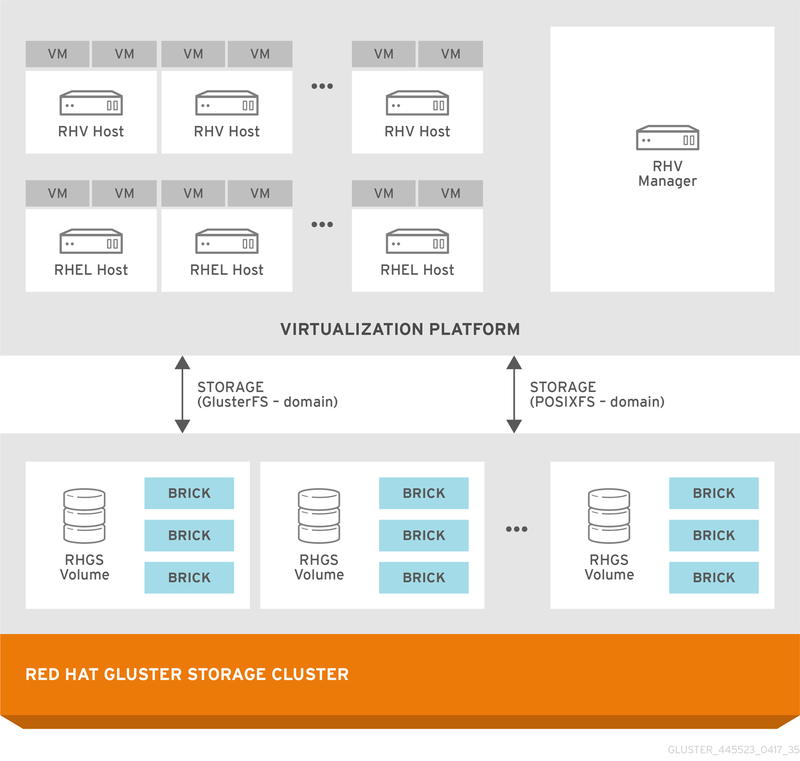 This guide shows you how to configure Red Hat Gluster Storage as a Red Hat Virtualization storage domain in a traditional, non-hyperconverged configuration. This configuration consists of Red Hat Virtualization hosts, and Red Hat Gluster Storage servers, as illustrated in Figure 1.1, “Architecture of integrated Red Hat Virtualization and Red Hat Gluster Storage”. Red Hat Virtualization 3.3 onwards includes the GlusterFS storage domain to enable future support for the libgfapi protocol. The GlusterFS storage domain uses the same access mechanism as the POSIXFS domain. This chapter outlines the requirements for creating a supported integration of Red Hat Gluster Storage and Red Hat Virtualization. All installations of Red Hat Virtualization and Red Hat Gluster Storage must have valid subscriptions to Red Hat Network channels and Subscription Management repositories. Red Hat Virtualization installations must adhere to the requirements laid out in the Red Hat Virtualization Installation Guide: https://access.redhat.com/documentation/en-us/red_hat_virtualization/4.2/html/installation_guide/index. Red Hat Gluster Storage installations must adhere to the requirements laid out in the Red Hat Gluster Storage Installation Guide: https://access.redhat.com/documentation/en-us/red_hat_gluster_storage/3.4/html/installation_guide/chap-planning_red_hat_storage_installation. Red Hat Gluster Storage installations must be completely up to date with the latest patches and upgrades. Refer to the Red Hat Gluster Storage 3.4 Installation Guide to upgrade to the latest version: https://access.redhat.com/documentation/en-us/red_hat_gluster_storage/3.4/html/installation_guide/. The versions of Red Hat Virtualization and Red Hat Gluster Storage integrated must be compatible, according to the table in Section 2.2, “Compatible Versions”. A fully-qualified domain name must be set for each hypervisor and Red Hat Gluster Storage server node. Ensure that correct DNS records exist, and that the fully-qualified domain name is resolvable via both forward and reverse DNS lookup. Server-side quorum, client-side quorum, and sharding are all required for a supported configuration. These are enabled by default in the virt tuning profile covered in Chapter 4, Hosting Virtual Machine Images on Red Hat Gluster Storage volumes. See Preventing Split-brain for information about how quorum settings help prevent split brain. See Creating Sharded Volumes for information about why sharding reduces heal and geo-replication time. The product and package versions required to create a supported deployment of Red Hat Gluster Storage (RHGS) nodes managed by the specified version of Red Hat Virtualization (RHV) are documented in the following knowledge base article: https://access.redhat.com/articles/2356261. The Red Hat Virtualization Manager is the control center of the Red Hat Virtualization environment. Ensure that Red Hat Virtualization Manger is installed and configured. Install and configure Red Hat Virtualization Manager. See Installing the Red Hat Virtualization Manager in the Red Hat Virtualization Installation Guide for more information: https://access.redhat.com/documentation/en-us/red_hat_virtualization/4.2/html-single/installation_guide/#part-Installing_the_Red_Hat_Virtualization_Manager. Install the virtual machine hosts using either Red Hat Virtualization Hypervisor or Red Hat Enterprise Linux as hosts. Before beginning the installation process, ensure that all virtualization hosts meet the hardware requirements and that the installation of Red Hat Virtualization Manager is complete. During installation, set the fully qualified domain name (FQDN) and IP address for the server in order to avoid network conflicts. For information on installing the hypervisor, see Installing Hypervisor Hosts in the Red Hat Virtualization Installation Guide: https://access.redhat.com/documentation/en-us/red_hat_virtualization/4.2/html/installation_guide/red_hat_virtualization_hosts. You must install Red Hat Enterprise Linux 7 on a system to use it as a virtualization host in a Red Hat Virtualization environment. See Installing Red Hat Enterprise Linux Hosts in the Red Hat Virtualization Installation Guide for details: https://access.redhat.com/documentation/en-us/red_hat_virtualization/4.2/html/installation_guide/chap-red_hat_enterprise_linux_hosts. Red Hat Enterprise Linux hosts need to be registered and subscribed to a number of entitlements using either Subscription Manager or Red Hat Network Classic. For more information, see Enabling the Red Hat Virtualization Manager Repositories in the Red Hat Virtualization Installation Guide: https://access.redhat.com/documentation/en-us/red_hat_virtualization/4.2/html-single/installation_guide/#Enabling_the_Red_Hat_Virtualization_Manager_Repositories_standalone_install. A Red Hat Enterprise Linux virtualization host must be registered and subscribed to a number of entitlements using either Subscription Manager, See Subscribing to Required Channels using Red Hat Subscription Manager in the Installing Red Hat Enterprise Linux Hosts chapter of the Red Hat Virtualization Installation Guide for more information. For more information, see Installing Native Client in the Red Hat Gluster Storage Administration Guide: https://access.redhat.com/documentation/en-us/red_hat_virtualization/4.2/html-single/installation_guide/#chap-Red_Hat_Enterprise_Linux_Hosts. Define data centers and clusters to organize the virtualization hosts. The installation process creates a data center and associated cluster named Default. A server can be a Red Hat Virtualization Hypervisor or a Red Hat Enterprise Linux host. A trusted storage pool requires a minimum of one storage host, and at least one active virtualization host is required to connect the system to a storage pool. Install the latest version of Red Hat Gluster Storage on new servers, not the virtualization hosts. For more information on obtaining and installing the software, see the Red Hat Gluster Storage Installation Guide: https://access.redhat.com/documentation/en-us/red_hat_gluster_storage/3.4/html/installation_guide/chap-installing_red_hat_storage. Configure Red Hat Gluster Storage volumes as required by your use case, ensuring that you adhere to the Chapter 2, Support Requirements. Optimize your Red Hat Gluster Storage volumes for storing virtual machine images by following the instructions in Procedure 4.1, “Configuring Volumes Using the Command Line Interface”. Red Hat Virtualization uses a centralized storage system for virtual machine disk images. Before adding storage, ensure that you have a working Red Hat Virtualization Manager environment. You must be able to access the Administration Portal, and there must be at least one host connected with Up status. Check that you can access the Red Hat Virtualization Manager Administration Portal and that at least one virtualization host has Up status before you continue. You can now create virtual machines and its disk images on the Red Hat Gluster Storage volumes by following the instructions in Section 4.2, “Configuring Virtual Machines on Red Hat Gluster Storage volumes using the Red Hat Virtualization Manager”. The readahead mechanism is essential for sequential read performance on virtual machines. For virtual machines that run on Red Hat Gluster Storage, the virtual-guest profile does not provide sufficient readahead by default. You can improve virtual machine performance by editing the virtual-guest profile to provide a more suitable readahead value. Install the tuned daemon that tunes the system settings dynamically. In the /etc/tune-profiles/virtual-guest/ktune.sh file, change the value of the multiply_disk_readahead option to 16. Red Hat Gluster Storage provides a POSIX-compatible file system to store virtual machine images in Red Hat Gluster Storage volumes. This chapter describes how to configure volumes using the command line interface, and how to prepare Red Hat Gluster Storage servers for virtualization using Red Hat Virtualization Manager. Red Hat recommends configuring volumes before starting them. For information on creating volumes, see Red Hat Gluster Storage Volumes in the Red Hat Gluster Storage Administration Guide: https://access.redhat.com/documentation/en-us/red_hat_gluster_storage/3.4/html/administration_guide/chap-red_hat_storage_volumes. For more information on available tuning profiles, refer to the tuned-adm man page, or see the Red Hat Gluster Storage 3.4 Administration Guide: https://access.redhat.com/documentation/en-us/red_hat_gluster_storage/3.4/html/administration_guide/. When you upgrade, a new virt file may be created in /var/lib/glusterd/groups/virt.rpmnew. Apply the new virt file to the existing volumes by renaming the virt.rpmnew file to virt. Assign volumes that store virtual machine images to the virt volume group to apply the settings in the virt profile. This has the same effect as the Optimize for Virt Store option in the management console. See Appendix A, The virt group profile for more information about this configuration. Volumes in the virt group must only be used for storing machine images, and must only be accessed using the native FUSE client. Run the following command to improve the performance of volume self-heal operations. Set the brick permissions for vdsm and kvm. If you do not set the required brick permissions, creation of virtual machines fails. The following procedure describes how to add a Red Hat Gluster Storage server for virtualization using Red Hat Virtualization Manager. 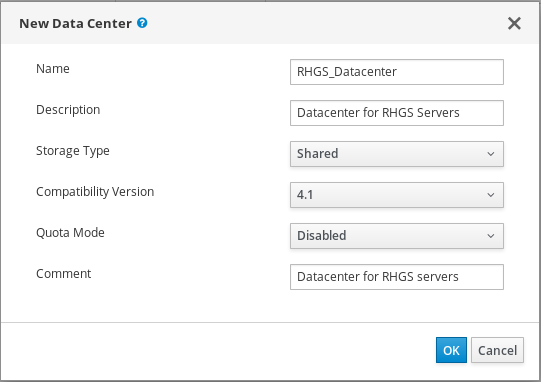 It is recommended that you use a separate data center for Red Hat Gluster Storage nodes. Select the Data Centers resource tab to list all data centers. Select the storage Type as Shared from the drop-down menu. Select the Quota Mode as Disabled. The new data center is Uninitialized until you configure the cluster, host, and storage settings. Select the Clusters resource tab to list all clusters. Select a Data Center for the cluster from the drop-down menu. Select the CPU Name and Compatibility Version from the drop-down menus. Select the Hosts resource tab to view a list of all hosts in the system. A Red Hat Enterprise Linux hypervisor and Red Hat Virtualization hypervisor on a single VDSM cluster accessing the same virtual machine image store is not supported. 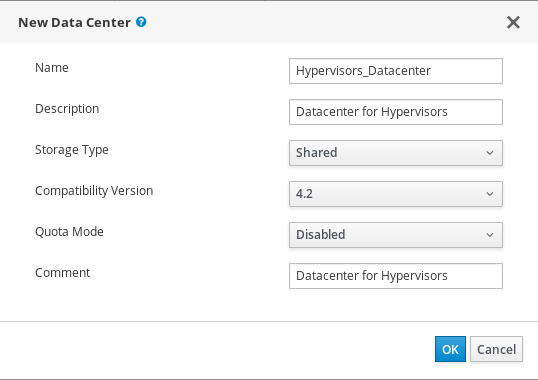 Select the Data Center and Host Cluster for the new host from the drop-down menus. Enter the Name, Address, and Root Password of the new hypervisor host. Check Automatically configure host firewall if required. The new host appears in the list of hypervisor hosts with the status Installing. After the host is activated, the status changes to Up automatically. Create and configure volumes on the Red Hat Gluster Storage cluster using the command line interface. For information on creating and configuring volumes, see Section 4.1, “Configuring Volumes Using the Command Line Interface” and Red Hat Gluster Storage Volumes in the Red Hat Gluster Storage Administration Guide: https://access.redhat.com/documentation/en-us/red_hat_gluster_storage/3.4/html/administration_guide/chap-red_hat_storage_volumes. Select the Storage resource tab to list existing storage domains. Select a shared Data Center to associate with the storage domain. Set the Domain Function to Data and the Storage Type to GlusterFS. Select a host from the Host to Use drop-down menu. Check the Use managed gluster volume checkbox and select the appropriate volume from the Gluster dropdown menu. This dropdown menu is only populated with volumes whose nodes are managed by Red Hat Virtualization Manager. See Chapter 5, Managing Red Hat Gluster Storage Servers and Volumes using Red Hat Virtualization Manager for instructions on how to set up management of your Red Hat Gluster Storage nodes by Red Hat Virtualization Manager. 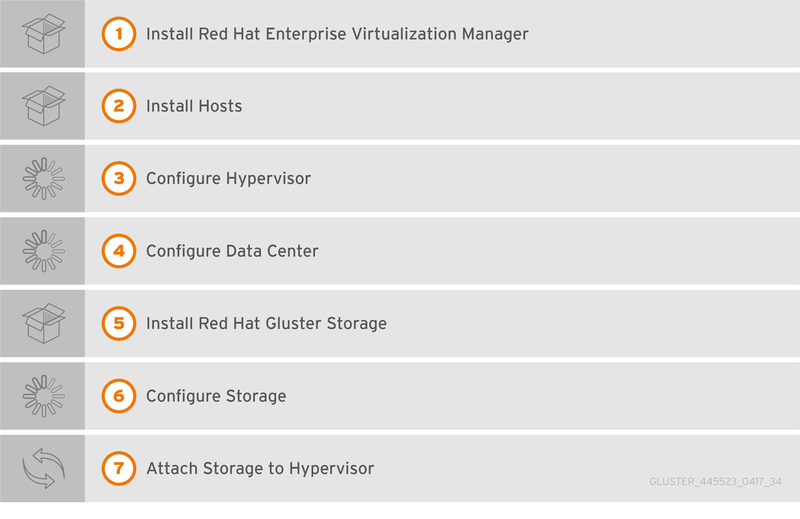 Enter the applicable Red Hat Gluster Storage native client Mount Options. Enter multiple mount options separated by commas. For more information on native client mount options, see Creating Access to Volumes in the Red Hat Gluster Storage Administration Guide: https://access.redhat.com/documentation/en-us/red_hat_gluster_storage/3.4/html/administration_guide/chap-accessing_data_-_setting_up_clients. Note that only the native client is supported when integrating Red Hat Gluster Storage and Red Hat Virtualization. You can now create virtual machines using Red Hat Gluster Storage as a storage domain. For more information on creating virtual machines, see the Red Hat Virtualization Virtual Machine Management Guide: https://access.redhat.com/documentation/en-us/red_hat_virtualization/4.1/html/virtual_machine_management_guide/. To prevent the risk of split brain incidents on Red Hat Gluster Storage domains, the use of shareable disks on Red Hat Gluster Storage domains is disabled. Attempting to create a shareable disk brings up a warning in the administration portal which recommends the use of Quorum on the Red Hat Gluster Storage server to ensure data integrity. This policy is not enforced on Red Hat Gluster Storage domains created on a POSIX domain with GlusterFS specified as the virtual file system type. 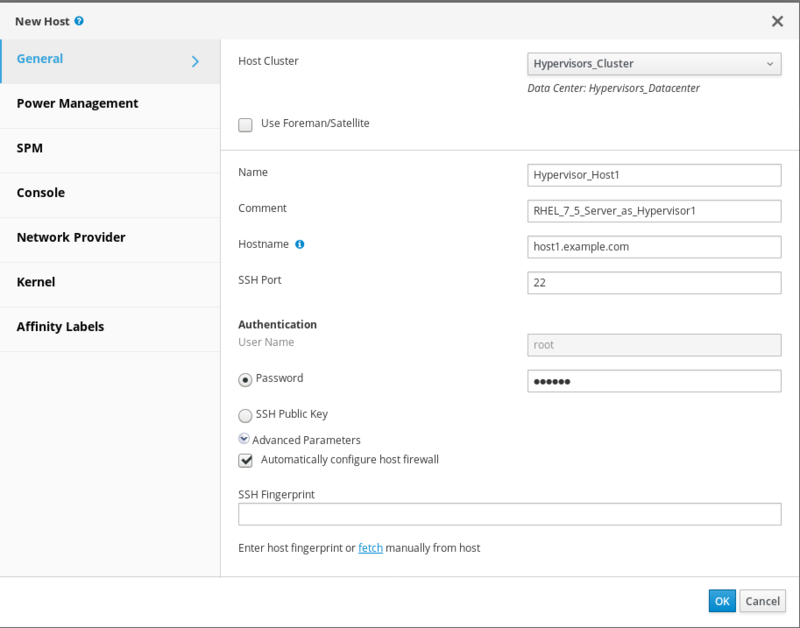 You can create and configure Red Hat Gluster Storage volumes using Red Hat Virtualization Manager 3.3 or later by creating a separate cluster with the Enable Gluster Service option enabled. A volume is a logical collection of bricks where each brick is an export directory on a server in the trusted storage pool. Most of the management operations for Red Hat Gluster Storage happen on these volumes. You can use Red Hat Virtualization Manager to create and start new volumes featuring a single global namespace. With the exception of the volume operations described in this section, all other Red Hat Gluster Storage functionalities must be executed from the command line. Click the New button to open the New Data Center window. Set Type to Shared from the drop-down menu. Set Quota Mode as Disabled. The new data center is added to the virtualization environment. It will remain Uninitialized until a cluster, host, and storage are configured. 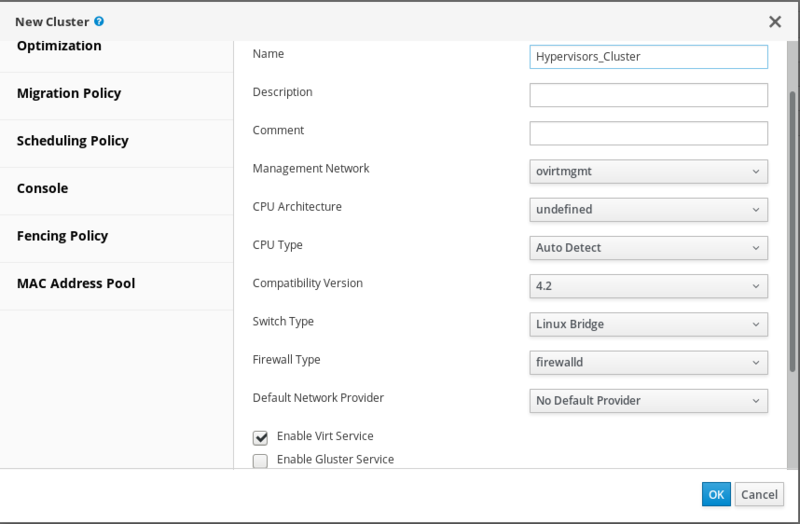 Create a cluster with the gluster service enabled. Select the Compatibility Version from the drop-down menu. While creating a cluster, use iptables for the option Firewall Type. There are two ways to add hosts. 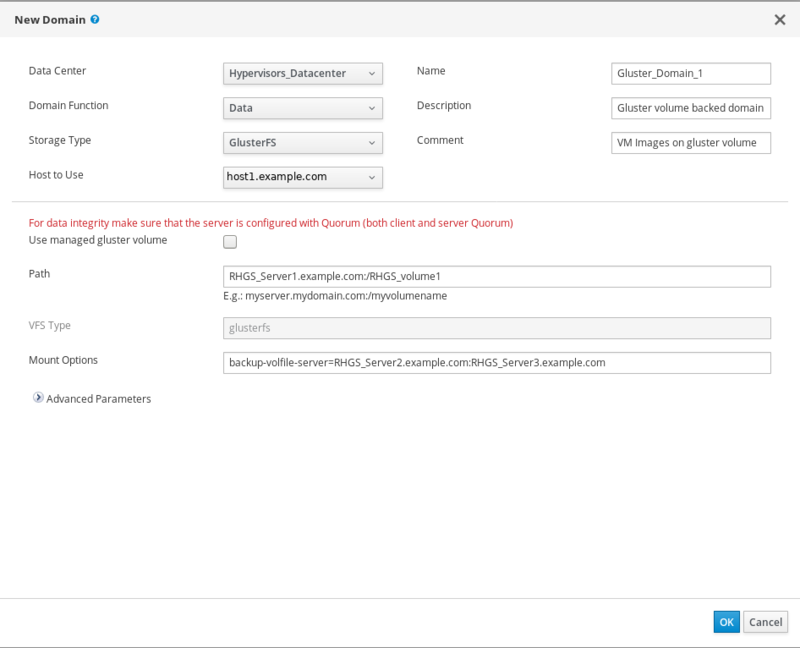 You can either add new hosts or import the existing gluster configuration into a cluster. Select Import existing gluster configuration. With this option you can import the existing Gluster configurations into a cluster. Provide the IP address of one of the hosts. Use the drop-down lists to select the Data Center and Host Cluster for the new host. The new host displays in the list of hosts with a status of Installing. The host is activated and the status changes to Up automatically. To add multiple servers to a cluster, you must first add a Red Hat Gluster Storage server to the cluster. An error message appears if you add multiple servers in the first attempt. If you have not already selected Optimize for Virt Store while creating a volume, select this option now to optimize your storage for virtual machine images. This has the same effect as adding the volume to the virt group. On the Volumes tab, select the volume to configure and click Optimize for Virt Store. The volume is configured and group, storage-owner-uid, and storage-owner-gid options are set. For more information on each volume set tunable options, see Managing Red Hat Gluster Storage Volumes in the Red Hat Gluster Storage Administration Guide: https://access.redhat.com/documentation/en-us/red_hat_gluster_storage/3.4/html/administration_guide/chap-managing_red_hat_storage_volumes. In the Volumes tab, select the new volume and click Start to start the volume. If you are using Red Hat Gluster Storage Volumes for hosting Virtual Machine images, you must optimize the volume before attaching the volume to the storage domain. Click Add Bricks to add bricks to your volume. A brick is the basic unit of storage, represented by an export directory on a server in the storage cluster. 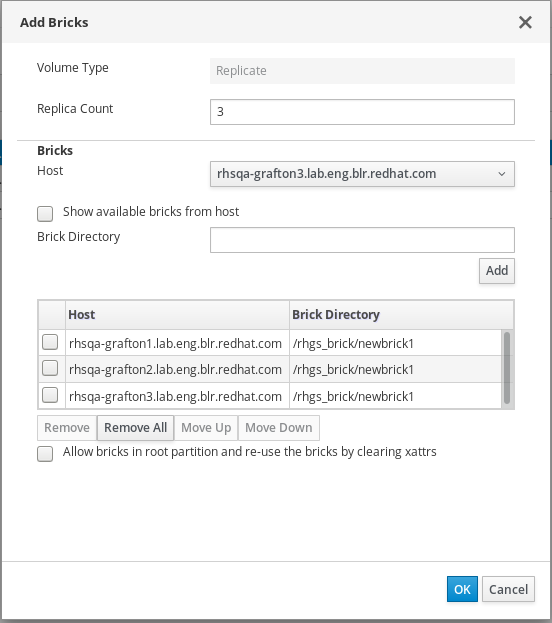 You can expand or shrink your cluster by adding new bricks or deleting existing bricks. Enter the path for the brick and click OK. In the Allow Access From field, specify volume access control as a comma-separated list of IP addresses or hostnames. By default, an asterisk (*) is used as a wildcard to specify ranges of addresses such as IP addresses or hostnames. You need to use IP-based authentication for Gluster exports. Click OK to create the volume. The new volume is added and it appears on the Volumes tab. You can create a storage domain using the optimized volume and manage it using Red Hat Virtualization Manager. See the Red Hat Gluster Storage 3.4 Console Administration Guide for more information on managing volumes such as start, stop, expand, shrink, add and edit volume options: https://access.redhat.com/documentation/en-us/red_hat_gluster_storage/3.4/html/console_administration_guide/. From the Red Hat Virtualization Manager 3.4 release onwards, you can perform asynchronous tasks on the Red Hat Gluster Storage volume such as rebalance and remove brick operations. For detailed instructions on performing these asynchronous tasks, see the Red Hat Gluster Storage Console Administration Guide: https://access.redhat.com/documentation/en-us/red_hat_gluster_storage/3.4/html/console_administration_guide/. The /var/lib/glusterd/groups/virt file defines a configuration that is used for all volumes in the virt group. Defining a group configuration and adding volumes to a group helps save time and effort when you want to update the settings on all volumes in the group. The majority of these settings prevent caching in the client stack. The cluster.eager-lock option optimizes write performance by using synchronous replication when there is a single writer to a file. The cluster.data-self-heal option specifies how self-heal operations are performed. The features.shard and features.shard-block-size options enable sharding behavior in the volume and set a block size appropriate for storing disk images. The cluster.quorum-type=auto and cluster.server-quorum-type options enable client and server-side quorum to help ensure consistency and to prevent split-brain scenarios. The default settings of cluster.quorum-type=auto and cluster.server-quorum-type=server provide consistency at the cost of fault tolerance. Using these settings, if server-side quorum is not met, virtual machines pause because volumes are not available. If client-side quorum is not met, virtual machines pause even though a read-only replica pair is available. Manual intervention is then required to make the VMs resume the operations after the quorum is restored. See Supported Volume Options in the Red Hat Gluster Storage 3.4 Administration Guide for more information about any of these settings. Copyright © 2015-2018 Red Hat, Inc.